Oh, goodness – this topic is vast, and I think so many people have different experiences. During Mom’s three years being off and on chemo, she experienced a multitude of symptoms, but rarely experienced the classic nausea and vomiting. She did, however, often have a low appetite, and so would eat things like tapioca pudding or Ensure to keep calories coming in. Symptoms are different depending on what type of chemo medication a person is taking. Some meds result in hair loss, but not all. Some cause a terrible amount of nausea, and some are easily controlled with anti-nausea meds. But there were many other effects that were a surprise. When Mom was on a chemo cycle, she often got terrible mouth sores, which we would attempt to alleviate with a prescription mouth wash made with lidocaine. During these times, she would not be able to eat acidic foods, so our menu would change to accommodate her needs. Another med caused the skin on her hands and feet to blister and even slough off, and made them very sensitive and sometimes painful. When this problem was very bad, Mom wore soft socks and gloves, and stayed off of her feet. We put natural lotions and ointments such as “Unpetroleum Jelly” in an attempt to keep the skin soft and less irritated. Sometimes we would put these lotions and ointments inside her socks and gloves. For the chemo cycles that caused her to lose her hair, we found that her head would get very cold, so she slept with caps on. She would pencil in her eyebrows and put on eyeliner as she also lost her eyebrows and eyelashes. Chemo and the cancer also caused a lot aches and pains, which she, of course, took pain medication for, but also would alleviate with warm corn bags and heating pads, or warm baths. And then there were the hundreds of other ways that chemo had an affect on how the body functions, causing interruptions and complications large and small. So many things to remember as more and more new medications were introduced, i.e., chemo has messed with clotting factors so we are now taking Coumadin, and not to eat too many greens so as not to further mess with clotting factors. And by the way, also make sure to eat lots of fruits and veggies so as not to get constipated, and so on, around and around. To say it is head-spinning to keep up with it all is a drastic understatement. What were some of the side effects you or your loved one experienced with chemo, and how did you deal with them? Mom grew up in a small town called Payette, on the border between Oregon and Idaho, on the Idaho side. As a child, she would frequently travel with her family to the Oregon coast, where, in good times, they would rent a house on Depoe Bay. In the year after Mom was diagnosed with breast cancer, there was so much going on that we didn’t really have time to think. She underwent aggressive chemotherapy in advance of her double mastectomy, to shrink the cancer down enough to even do the surgery, as it had invaded the skin of the breast. As a side-effect of the chemo, she was hospitalized for multiple pulmonary emboli, as well as some other fun stuff, such as pneumonia, kidney stones, and life-threatening leukopenia (very low white blood cell count). Add to that the fact that I was starting up my new practice in Colorado after our sudden move to care for her (and the accompanying lack of income), and there wasn’t much time to think about anything else. But after that first intense year, her cancer was knocked down to almost nothing, and Mom was feeling pretty good. My practice was starting to grow, and I felt some freedom with funds, so I began to think about how we could make good use of this time with her. 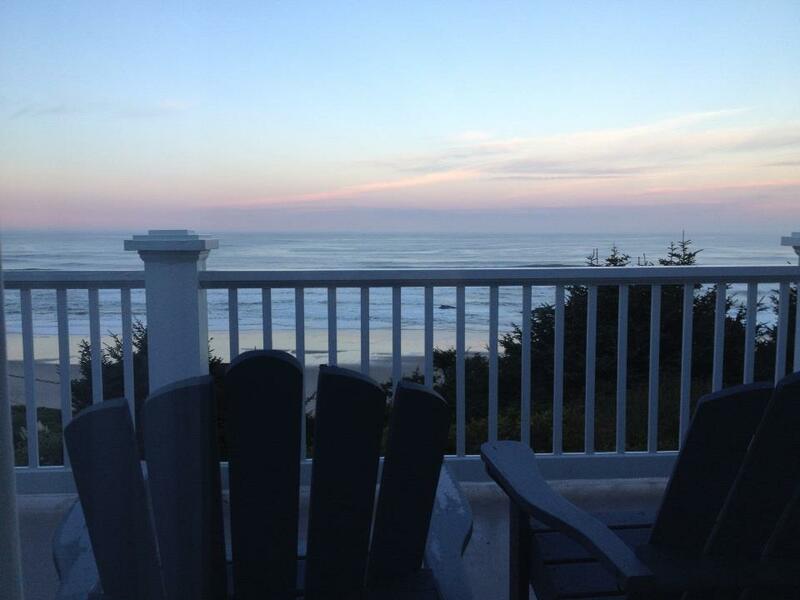 I had a gap in client due dates in October of 2012, and I decided to book ten days in a beach house on the Oregon coast. The trip would be a total of three weeks, including a long stay in Mom’s childhood stomping grounds in Idaho. In the months leading up to our trip, she continued to get checkups and scans. Most of that year, things went fabulously, and we were very optimistic. 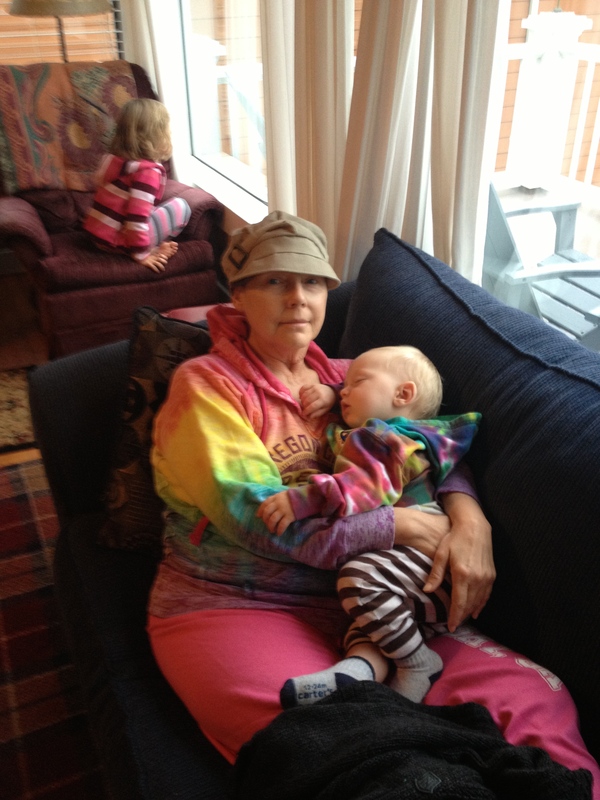 Right before we left for our trip, though, a PET scan revealed that her cancer had spread again. Mom was devastated that she would have to have chemo again, and resisted her doctor’s urging to start treatments before our trip. After much family discussion, we agreed that a month’s delay in chemo was too much of a gamble with her aggressive cancer, and so she got her first dose right before we hit the road. 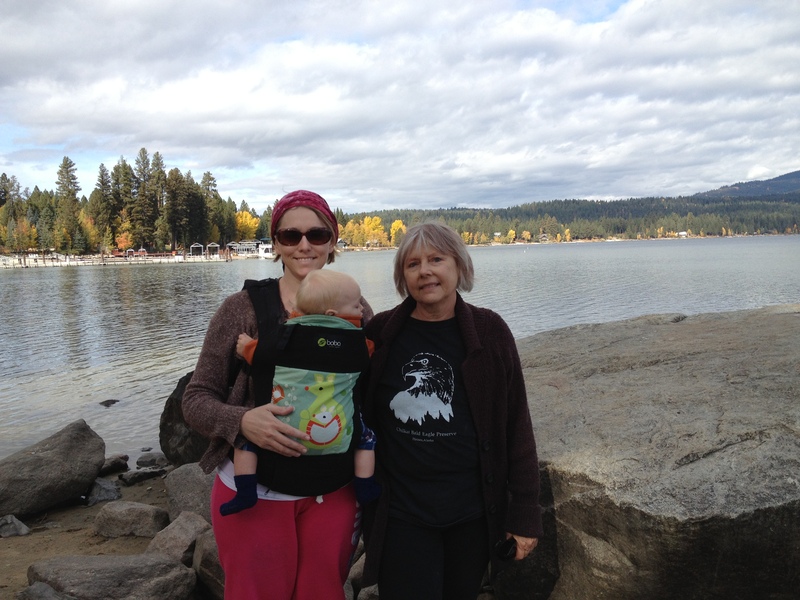 In these two pictures from Payette Lake, you can tell that Mom wasn’t feeling as awesome as she could have been, but she had her hair back, and we were having a great time. She loved road trips, and she was handling the long hours in the car with no problem, while we talked about anything and everything. This was about a week into our trip, and the side effects of the chemo hadn’t really started yet. Mom could not believe that this whole house was ours for ten days. Her brother and nephew, as well as one of my sisters and her family, stayed there with us. We had a glorious time, with Mom leading the way on a tour through all of the places she’d loved as a child: The Sea Lion Caves, whale watching at Depoe Bay, the Newport bay front and eating at Mo’s. Soon, though, the chemo started to catch up with us, and Mom’s hair began to fall out again. And so, one of those precious nights in the beach house was spent in tears, as we all sat in the kitchen and I shaved Mom’s head again. She was heartbroken to lose her hair again, and we were heartbroken to face the unspoken truth that, despite the optimism we had experienced earlier in the year, the cancer was here to stay. 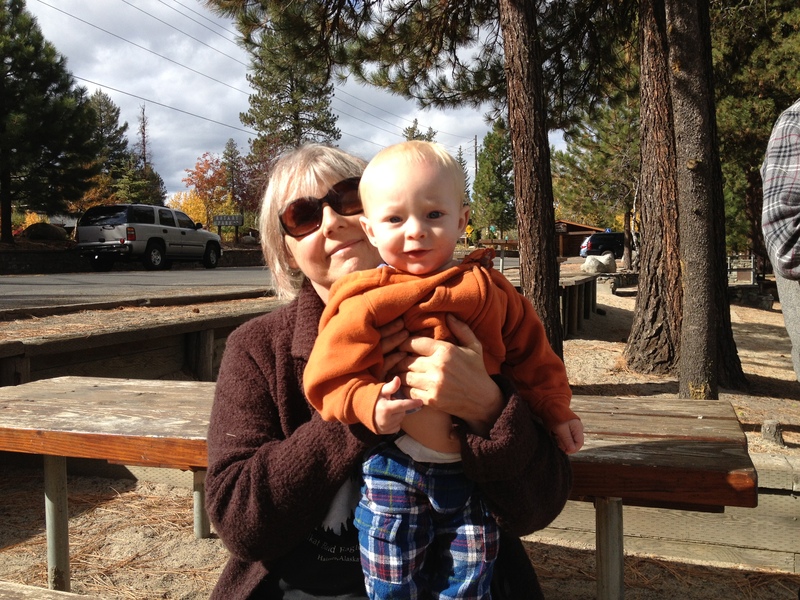 In this picture, Mom is holding her grandson, my Emmett, wearing the happy clothes she had purchased in Depoe Bay (she loved color). You can tell she wasn’t feeling well, and she wore the hat because her hair was gone. Much of the remaining time in Oregon was spent sitting on this couch, looking at the ocean through the picture window, enjoying the wood-burning fireplace, and practicing visualization exercises for her restored health. Here’s where the raccoon comes in. Let me preface this by saying that Mom had a really dark sense of humor, and as horrible as what I am about to tell you is, she thought it was hilarious. There was a raccoon that lived around the beach house, and we had to lock our trash up in a special box outside so that the darn thing wouldn’t get into it. Unfortunately, on the evening we shaved Mom’s head, the children took the trash out, and while they did lock the doors on the box, they failed to put the trash bags in the bins, and instead left them on the floor of the box. When we emerged the next morning to go about our day, we found that said raccoon had stuck its evil little hand under the doors of the box and had ripped open the trash bags. Our trash was all over the quiet road in front of our house. OMG! I know, the horror. 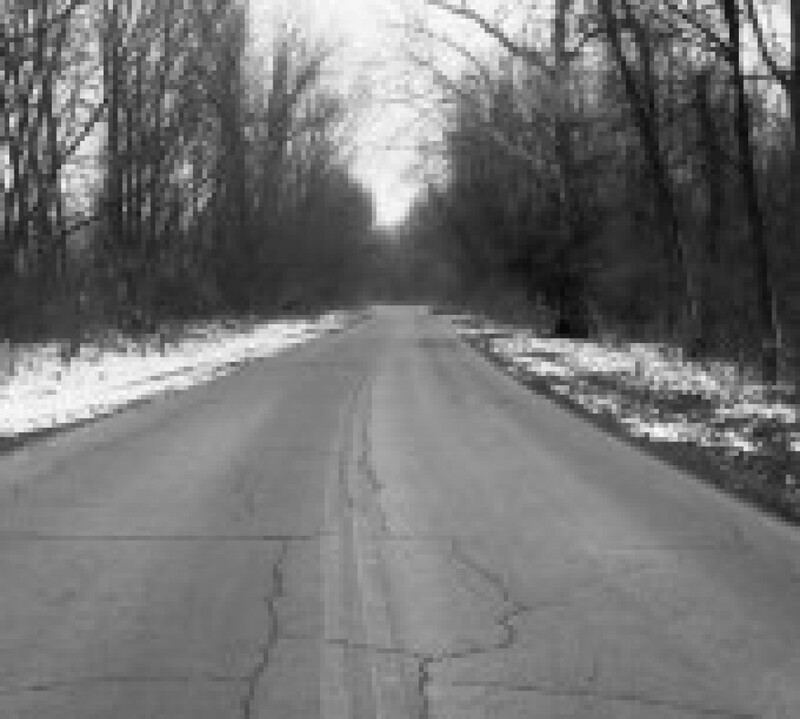 Yep, it was pretty much as bad as you think it could possibly have been, crawling around, picking up bits of my mother’s hair from wet Oregon asphalt. Luckily, we were comforted by the sounds of Mom laughing uproariously in the background as we suffered. She’s probably laughing right now at the memory as I write this. I hope she is. Today is the seven month anniversary of my mom’s death, and I finally worked up the nerve to start going through her things just this week. I don’t think I’m one of those people who leaves a “shrine” up for a lost loved one, but it’s kind of happened as a consequence of my avoidance behavior. I have snapped at anyone who wants to mess with Mom’s room or her stuff until I can “find the time” to take care of it. But, it’s not that there’s not time. There has been plenty of time, clearly. 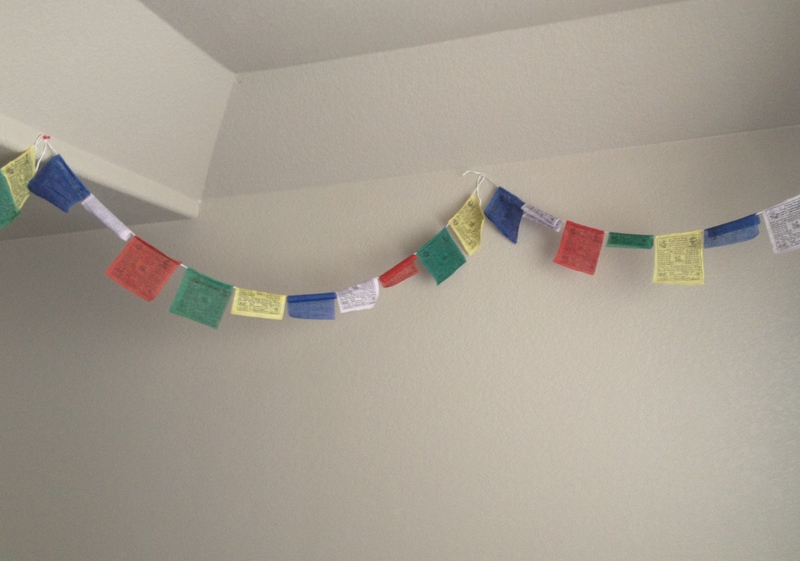 It’s just that whenever I looked through the glass doors of her room at the Tibetan prayer flags hanging over her bead and her cute little pug figures, I just couldn’t do it. This was a room where a human being slept and dreamed and read and wrote in her journal. Where she wept and feared in privacy after a day of putting on a strong face. Where her dogs all piled in bed with her, where artwork by the hands of her grandchildren and a framed, autographed picture of her eternal crush, Kevin Bacon, still hang on the walls. Truthfully, Mom hadn’t slept in this room for several months before she passed. At some point, she had become too ill to be down in her apartment alone, so we moved her up to the main level and set up a hospital bed in the family room. We put some shelves up on the wall for her knick knacks and some pictures, and brought one of her bookshelves up so that she could have her precious books and journals nearby. We kept her bedroom ready for when she would be well enough to move back downstairs. But, she never was able to move back downstairs. So, her room stands much as it did a year ago, probably. It has some boxes piled in it now, of papers and other products of us trying to make sense of all of the estate business. There are a couple of laundry baskets full of Christmas presents that Mom received but never used, as her steep decline started on Christmas Day, and she died on New Year’s Eve. There are some birthday presents in there, too, given early, as she would have turned sixty on January 3. These gifts mostly consist of comfort items, such as warm blankets, fuzzy socks, rice bags, and comfy pajamas, and books and journals. We often gave her inspirational books to help her keep up the fight. This time, I had given her a book called, “Dying to be Me”, about a woman who had a near-death experience due to cancer, and had returned to health. It sits in the basket, new and unread. I decided, this week, to at least go through and start sorting her things into categories so that my sister, Bree, and I can look at everything together and decide what to do with it all. It seems barbaric to give away these things, these items that Mom liked and loved and used. Sure, we will keep the things that hold sentimental value for us or that we knew were particularly special to Mom, but we simply can’t hang on to everything. I wonder who will use these things when we give them away? Who will enjoy all of her Denise Austin DVD’s, her weird snowman cookie jar and her vast collection of self-help books? Not to mention all of the pug stuff. The woman loved pugs. It also makes me wonder the same things about my own “stuff”. I look around at all of the things that I have collected over my life, and I wonder what people would do with it if I wasn’t here. How would people know what was precious and what was just “stuff?” I have the strong desire to sort everything and purge the non-essential things. These things just create clutter, literally and figuratively, making it harder to see what’s important underneath. I think, when I go, I might just want to have a wall full of artwork from my grandkids on my walls, a cushy bed that I slept in, with my books and journals alongside it. Oh, and don’t forget that my autographed copies of the Outlander books are precious, kids.